I’m simply captivated by the brilliant possibilities of balloon art! Since launching the business in 2013, my aim has been to showcase the potential of balloons which I share frequently on Facebook and Instagram. So please do join me on these networking sites and share my wonderful journey with me. There’s a whole new world of balloons out there waiting to be created and explored. My latest passion is to create large scale balloon scenes which transform an empty venue into one of fascination and wonder. 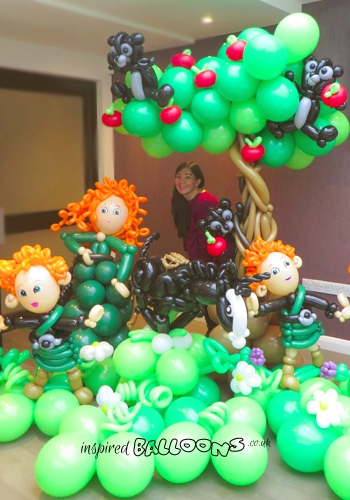 Using different shapes, sizes and colours of balloons with various twisting techniques and a bit of imagination, gives me great scope as a balloon artist. But there is still so much to learn and I continually try to develop my skills offering each customer balloon arrangements that are unique, customised and which push creative boundaries. A journey that has been spurred by the astounding creativity of the international balloon community who continually share their talents, designs and ideas to inspire each other. It’s been a real honour to be featured twice on Channel 4’s Kirstie’s Handmade Christmas, and to win the programme’s Tableau Competition. As Kirsty Allsop discovered making stuff with balloons is loads of fun and rewarding so why not find out yourself by organising a balloon modelling day for friends or colleagues. Whether you want to be entertained by quirky, often wearable, designs; make your own balloon art; or immerse yourself in a balloony world, I do hope you’ll get in touch to share my “wow!” designs with those you love, made to thrill people of all ages for that memorable occasion.